The model designation indicates the basic design of the unit. The code number which is stamped on the float bowl cover (air horn) directly above the fuel level sight plug, furnishes the key to the size, calibrations, and other alterations required for the particular year and series engine for which the unit is specified. Carburetors having different code numbers are not interchangeable even though the model designations are identical. The variations between carburetors having different code numbers may not be apparent on inspection, but they have a very important bearing on the performance of an engine. 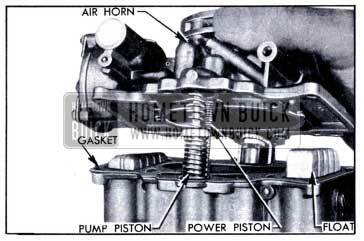 When ordering or using replacement parts for a 1951 Buick Stromberg carburetor always make certain that they are specified for the carburetor model and code number, as well as for the car model and series. 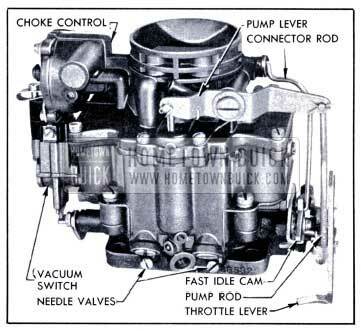 The AAV Stromberg carburetor is a dual barrel down-draft type. See figure 3-46. It contains a float system, idle (low speed) system, main metering (high speed) system, power system, accelerating system, and automatic choke. An accelerator vacuum switch, which is part of the cranking motor control circuit, is incorporated in the carburetor assembly. Air is supplied to both barrels of carburetor through the air horn which has one inlet and contains the choke valve. Fuel is supplied to both barrels from one float chamber. The float chamber encircles both barrels and contains a dual type float and lever assembly which actuates one float needle valve. The accelerating pump discharge nozzle in each barrel is supplied with fuel from one pump located in the float chamber. The power system for both barrels is controlled by one vacuum power piston. Except as noted above, each barrel forms a complete carburetor system. Each barrel contains an idle system with adjustable needle valve, a main metering system, accelerating pump discharge nozzle, primary and auxiliary venturi tubes, and a throttle valve. The throttle valves of both barrels are mounted in line on one stem. The dual construction provides the advantages of two carburetors in one compact unit. The dual carburetor and dual intake manifold provides more uniform distribution of fuel to all cylinders than would be possible with one single barrel carburetor. Operation of each system of the AAV Stromberg carburetor is described in the following subparagraphs. The automatic choke is described in paragraph 3-27, which follows. The accelerator vacuum switch is described in paragraph 10-33. Fuel enters the carburetor at the gasoline connection and flows through the strainer and needle valve seat into the float chamber. When the fuel reaches the prescribed level in float chamber, the dual float presses the needle valve against its seat to shut off the flow of fuel. Thereafter, the fuel is maintained at the prescribed level by opening and closing of the needle valve as required. 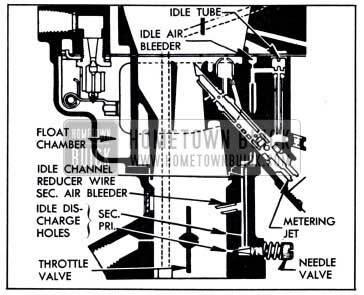 The float lever is hinged on a fulcrum pin and connected to the needle valve by a clip. See figure 3-47. The float chamber is vented externally through a port in air horn to allow fuel to be smoothly withdrawn through the various systems. Fuel is delivered to the engine through the idle system at closed throttle and light load speeds up to approximately 20 MPH. The idle system also partially controls fuel supply for light load speeds up to approximately 30 MPH. 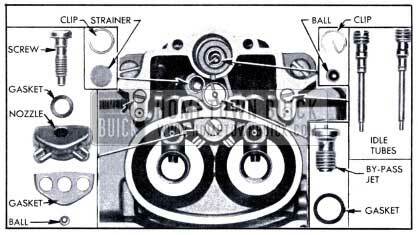 The operation of the idle system in each barrel of the carburetor is identical. Fuel flows from the float chamber through main metering jet and upward through the idle tube which meters the fuel. From the idle tube it flows through a connecting channel where air from the idle air bleeder is mixed with it so that a mixture of air and fuel passes down the idle channel to the idle discharge holes. Additional air is drawn into the fuel air mixture in the idle channel through the secondary air bleeder. See figure 3-48. On idle or closed throttle operation, the fuel­air mixture is drawn only from the lower or primary idle discharge hole due to high suction at this point. As throttle valve is opened, suction is also placed on the upper or secondary idle discharge hole to feed additional fuel. Fuel supplied through the idle discharge holes begins to diminish when the throttle valve is opened to the point where the main metering system begins to supply fuel, as described below, until a throttle position is reached where the idle system ceases to function. The idle needle valve controls the quantity of fuel that is supplied through the primary idle discharge hole, thereby affecting the final fuel-air ratio supplied to the engine while the idle system is in operation. The main metering system controls the flow of fuel during the intermediate or part-throttle operation, starting at approximately 20 MPH and continuing up to approximately 75 MPH. 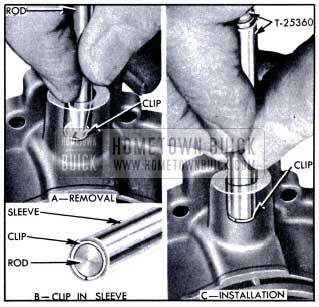 The operation of the main metering system in each barrel of the carburetor is identical. Air entering the barrel through the air horn passes through the primary and auxiliary venturi tubes which increase the velocity of the air and create a suction on the main discharge jet. This causes fuel to flow from the float chamber through the main metering jet into the main discharge jet. 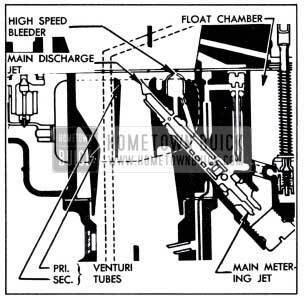 Air is drawn in through the high speed bleeder so that a mixture of fuel and air is discharged from the main discharge jet into the air stream passing through the auxiliary venturi in the barrel of the carburetor. See figure 3-49. The main discharge jet is designed so that if any vapor bubbles are formed in the hot gasoline, the vapors will follow the outside channel around the main discharge jet instead of passing through the jet tube. These vapor bubbles escape through the dome-shaped high speed bleeder and thereby reduce percolating troubles. For maximum power or high speed operation above approximately 75 MPH a richer mixture is required than that necessary for normal throttle opening. The richer mixture is supplied through the main metering systems of both barrels of carburetor by means of the power system. The power piston cylinder is connected by a channel to the intake manifold. At part throttle position the manifold vacuum is sufficient to hold the power piston in its “up” position against the tension of the piston spring. When the throttle valve is opened to a point where additional fuel is required for satisfactory operation, the manifold vacuum decreases sufficiently so that the piston spring moves the power piston down to open the power by-pass jet. Opening of the by-pass jet allows additional fuel to enter the main discharge jets through a by-pass channel without passing through the restricted main metering jet. See figure 3-50. For smooth and rapid acceleration it is necessary to supply an extra quantity of fuel momentarily when the throttle is suddenly opened. This is accomplished by operation of the accelerating pump piston which is directly connected to the throttle valve lever by means of a rod and pump lever. See figure 3-51. When the throttle is closed, the pump piston moves up and draws a supply of fuel from the float chamber through the inlet check valve into the pump cylinder. 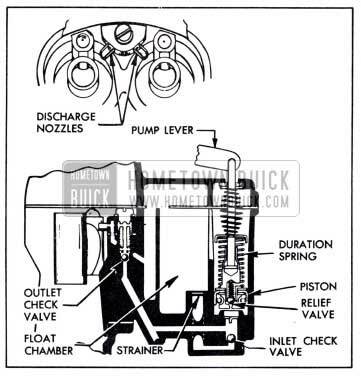 When the throttle valve is opened, the piston on its downward stroke exerts pressure on the fuel which closes the inlet check valve, opens the outlet check valve, and discharges a metered quantity of fuel through the pump discharge nozzles in each barrel of carburetor. This occurs only momentarily during the accelerating period. The pump duration spring provides a follow-up action so that the fuel discharge carries out over a brief period of time. The relief valve in the pump piston prevents excessive build-up of pressure in the accelerating systems when the throttle is suddenly snapped open. When the desired speed is reached and the throttle is held in fixed position, the pressure on the fuel in the pump cylinder decreases sufficiently so that the outlet check valve closes and fuel ceases to discharge from the pump nozzles. With the throttle held in a fixed position the fuel flows only through the idle or main metering systems as previously described. 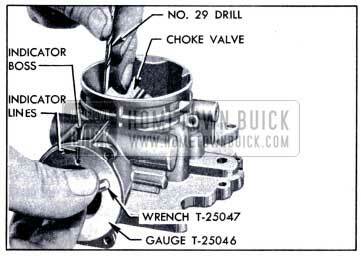 The 1951 Buick Stromberg automatic choke consists of a choke valve mounted on a stem or shaft in the carburetor air horn, a bi-metal thermostat and cover, a vacuum actuated piston located in a choke housing attached to the air horn, a fast idle rod connecting the choke valve to a fast idle cam mounted on carburetor throttle body. An upper heat pipe connects the choke housing to a lower heat pipe in the exhaust manifold. The choke valve is mounted off-center in the choke stem so that the force of air stream passing through the air horn tends to move valve to the open position. A short lever mounted on the choke stem in choke housing is engaged by the free outer end of the thermostat which, when cold, tends to close the choke valve. 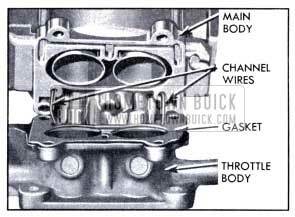 The piston, which is actuated by intake manifold vacuum, is connected by a link to the short lever on choke stem and tends to open the choke valve when the engine fires. The lower heat pipe in the exhaust manifold heats the air which is drawn through it and the upper heat pipe into the choke housing. A small slot in the vacuum piston and a small hole in choke housing permit manifold vacuum to draw the air into the choke housing to heat the thermostat. The fast idle cam is connected by the fast idle rod to a lever on the outer end of the choke stem so that it is rotated as the choke valve moves. In closed throttle position, the throttle stop screw bears against one edge of the fast idle cam which has a number of steps of different heights to give different amounts of throttle opening, depending on positions of the cam and choke valve. 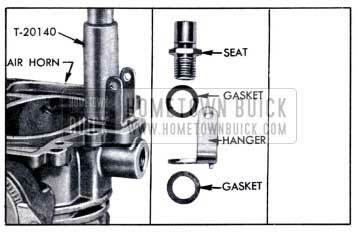 When the engine becomes cold the choke thermostat also becomes cold and increases its spring tension sufficiently to close the choke valve. It is prevented from closing the valve, however, because the throttle stop screw holds the fast idle cam in the slow idle position; consequently, the choke valve is held partially open. 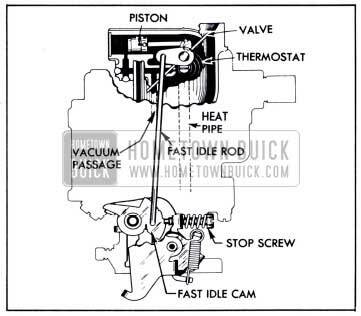 When the accelerator pedal is depressed to start the engine, the throttle stop screw is lifted clear of the fast idle cam and the thermostat then closes the choke valve. See figure 3-52. 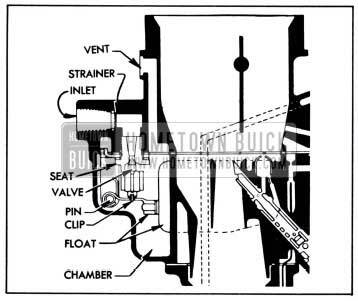 When the engine starts, intake manifold vacuum causes the piston to partially open the choke valve against the spring tension of thermostat, thereby admitting sufficient air to give a satisfactory running mixture. When accelerator pedal is released after starting the engine, the throttle stop screw comes to rest against a step of fast idle cam which was rotated to the fast idle position by the closing of choke. This provides proper throttle opening to prevent stalling of the cold engine. See figure 3-52. If the throttle is partially opened while the running engine is cold, the increased force of air flow against the off-set choke valve will open the valve against the spring tension of the thermostat. These opposing forces balance the choke valve at a position which provides the required choke action without causing loading or an excessively rich mixture. After starting, the vacuum piston does not help to open the choke valve. As the engine and exhaust manifold warm up, warm air is drawn through the heat pipes into the choke housing by manifold vacuum operating through the small slot in vacuum piston and hole in choke housing. This warms the thermostat, causing it to reduce its spring tension on choke valve in proportion to the increase in temperature. 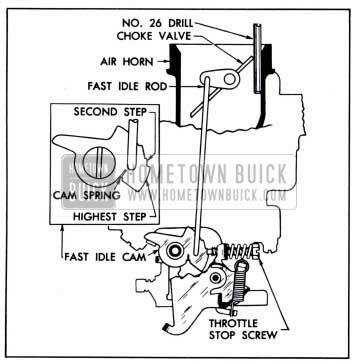 When the throttle is opened and throttle stop screw is lifted from the fast idle cam, the choke valve then moves to a more open position and the fast idle cam is rotated to bring a lower step into position for the throttle stop screw. The engine will then run at a lower speed at closed throttle. See figure 3-53. 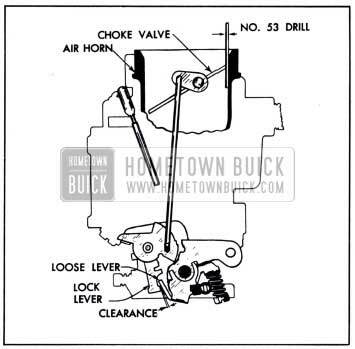 When the engine reached normal operating temperature, the choke thermostat is heated to the point where it no longer exerts any spring tension on the choke valve. The choke valve is in the wide open position and the fast idle cam is in the slow idle position so that the throttle stop screw bears against the lowest step of fast idle cam at closed throttle. See figure 3-54. If the engine becomes flooded for any reason, the choke valve can be partially opened by depressing accelerator pedal to the full extent of its travel. This causes a tongue or arm on the throttle lever to contact and rotate the fast idle cam, which forces the choke valve open. See figure 3-57. Remove air cleaner and silencer. Place a No. 26 drill between wall of air horn and the center of upper edge of choke valve, and hold valve firmly closed against the drill. See figure 3-55. 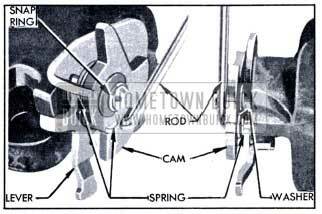 Make sure that the fast idle cam spring holds the cam up against end of fast idle rod, then close the throttle until stop screw contacts the fast idle cam. The screw should just clear the edge of the highest step of cam and bear against the second step, as shown in figure 3-55. If stop screw does not contact fast idle cam as specified, bend fast idle rod at the large curve as required to obtain specified contact. Remove the No. 26 drill and place a No. 53 drill at the same point, then hold choke valve firmly closed against the drill. See figure 3-56. 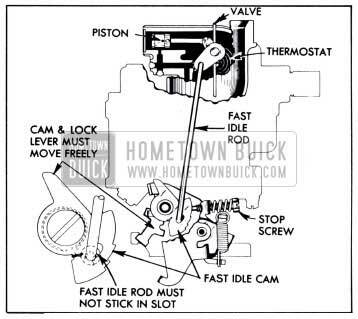 Slowly open and close throttle valve several times and check clearance between the start aid loose lever on throttle stem and the lock lever behind the fast idle cam as indicated in figure 3-56. Clearance should be just enough to allow the loose lever to pass the lock lever. Bend end of loose lever up or down as required to secure proper clearance. 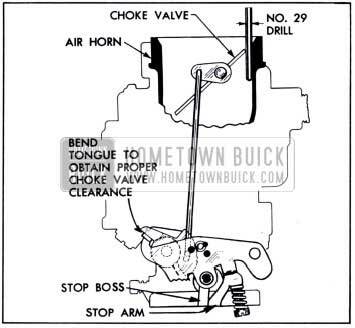 Open throttle until the stop arm on throttle lever bears against the stop boss on throttle body, then check clearance between wall of air horn and upper edge of choke valve, using a No. 29 drill. Bend the torque on throttle lever as required to obtain clearance equal to the No. 29 drill. See figure 3-57. Close the throttle and choke valve, then open the throttle against the tension of the start aid loose lever spring. The lock lever should release the loose lever and the spring tension before the stop arm on throttle lever contacts the stop boss on throttle body. Disconnect throttle rod, accelerator vacuum switch wires, choke upper heat pipe, vacuum spark control pipe, and gasoline pipe. 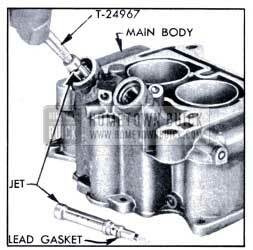 Remove gasoline filter from carburetor, then remove carburetor and gasket from manifold. Remove accelerator vacuum switch and gasket. Remove cotter pin and disconnect fast idle rod from choke stem lever. 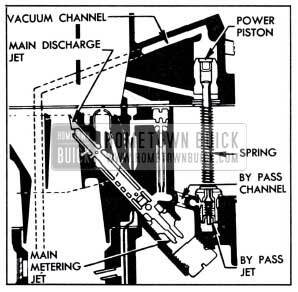 Disconnect pump rod from pump lever, remove pump lever fulcrum screw (left hand thread), then disconnect pump lever from stem of accelerating pump piston. Remove screws and carefully lift air horn straight up from main body to avoid damaging the float, pump piston, and vacuum power piston which are attached to air horn. Remove pump piston. See figure 3-58. Tap end of float lever fulcrum pin which is not serrated to remove the pin, then remove float and needle valve. Shake float to see whether it is “loaded” with gasoline due to a leak. Remove air horn gasket, then remove needle valve seat and float hanger using Wrench T-20140. See figure 3-59. Remove vacuum power piston from air horn by pushing spring down and applying pliers to outer end of piston stem, then using a 1″ block of wood as a fulcrum for pliers; pull piston straight up to avoid bending stem. See figure 3-60. CAUTION: Do not apply pliers to inner portion of stem because any nicks may cause later sticking of piston. Remove thermostat cover. Use Wrench T-25047 to remove nut from choke stem, then remove lockwashers and serrated washer. See figure 3-61. Remove screws and take choke valve out of stem. Remove choke stem and the choke vacuum piston assembly from air horn. Remove power by-pass jet and gasket, and both idle tubes from main body. See figure 3-62. Handle idle tubes carefully to avoid damaging small end which contains metering orifice. Remove pump discharge nozzle screw, nozzle and gaskets. Place hand on top of main body and invert body to catch the check valve ball located in discharge channel. See figure 3-62. Remove pump check valve ball retainer clip, using long nosed pliers, then remove check valve ball. See figure 3-62. Remove attaching screws and lift main body from throttle body. Remove gasket and idle channel wires from throttle body. Remove main discharge jet plugs using Screw Driver T-19099, remove copper gaskets, then remove main metering jets using Jet Socket T-24924. See figure 3-63. Remove main discharge jets by screwing Jet Remover T-24967 (R.H. thread) into base of jet, then pulling jets from main body. See figure 3 64. 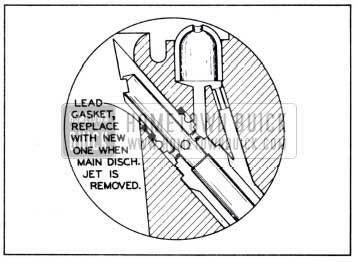 The threads formed in the main discharge jet by the tool will not affect the metering characteristics of the jet. NOTE: Make sure that main discharge jet lead gaskets are removed from main body. Before throttle valves are removed, they should be marked so that each valve may be reinstalled in the barrel from which it was removed and may be accurately positioned in the barrel of throttle body. Using a sharp scriber, lightly scratch one line on one valve and its barrel and two lines on the other valve and barrel; also scribe lines on each valve along both edges of the valve stem. See figure 3-65. After marking the parts remove screws and slide valves out of stem. Remove nut, lockwasher and switch lever from end of stem, then remove throttle lever and stem assembly from throttle body. Remove idle needle valves and springs from throttle body. Pry snap ring from post which supports fast idle cam, using thin screwdriver, then remove fast idle cam, lock lever, and spacer washer. Regardless of the number of new parts that are used in rebuilding a carburetor, the job in the end will not be satisfactory unless all metal parts are thoroughly cleaned. Because of the nature of carburetor parts, with numerous small passages subject to fouling with tenacious carbon and gum deposits, ordinary cleaning processes are entirely inadequate. The correct procedure is to use a cleaning bath in which metal parts can be immersed and “soaked” for sufficient time after disassembly to thoroughly clean all surfaces and channels. If the passages in main body appear to be heavily fouled with carbon or gum it is advisable to remove the lead ball plugs so that the cleaning solvent can penetrate and wash through the channels. 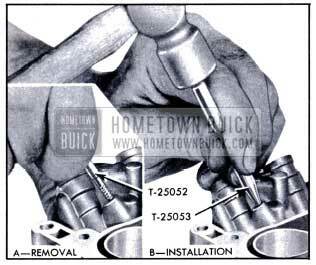 Lead ball plugs may be removed with Plug Remover T-25052, using care not to damage the plug seats in body. See figure 3-66, view A. Install new ball plugs after cleaning is completed, using Plug Set T-25053 to swage plug into its seat. See figure 3-66, View B. Air Horn and Choke Parts. It is very necessary for the vacuum piston and the cylinder in air horn to be clean and free of burrs or scores. Do not use any abrasive material for cleaning these parts. Check clearance of choke stem in bearings of air horn. If stem or bearings are worn so that excessive clearance exists, replace the worn parts. Make sure that bearings are free of gum. If thermostat is distorted or damaged it must be replaced with a new thermostat cover with thermostat assembly. The thermostat is not furnished separately because the “V” index mark is stamped on cover after installation of thermostat, to insure proper calibration. Replace inlet strainer if it is damaged or clogged so that it cannot be thoroughly cleaned, using Retainer Clip Replacer T-25360. Use small, end of rod of tool to remove retainer clip. To install clip, place it in tapered end of tool sleeve then use rod inside sleeve to push clip into place. See figure 3-67. Float Needle Valve and Seat. Because of the wear that normally occurs in these parts and the necessity of having a tight seating valve, it is advisable to replace these parts if the carburetor has been used for considerable mileage. Even if mileage is low, replace these parts if needle is grooved or seat is damaged. Vacuum Power Piston and By-Pass Jet. Make certain that the surface of the piston is thoroughly clean. Do not use any abrasive material for polishing the piston surface. Inspect for wear or damage. Replace if necessary. Test by-pass jet for tight seating by sucking on the upper end. Replace jet if doubtful. Main Body. Make certain the main body is thoroughly clean and that all passages are free of foreign material. Check high speed and idle air bleeders for correct sizes, using a drill shank as a gauge. 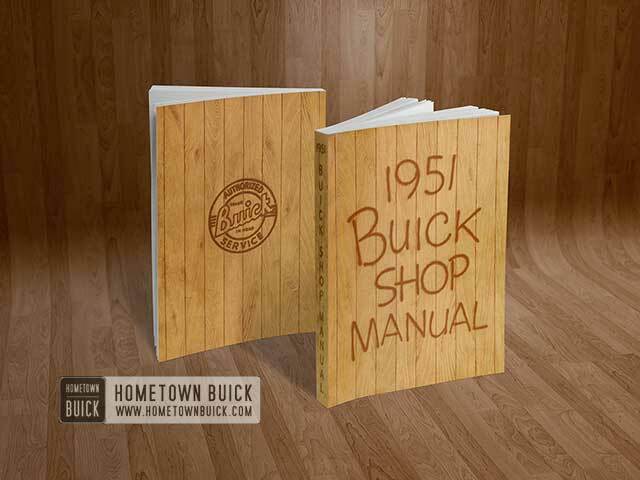 For drill sizes see 1951 Buick Stromberg carburetor Calibrations, Paragraph 3-1. Replace pump strainer if it is damaged or clogged so that it cannot be thoroughly cleaned. Use Retainer Clip Replacer T-25360 as previously explained but use shouldered end of sleeve for installing retainer clip. See figure 3-67. Main Discharge Jets and Idle Tubes. Inspect tips of main discharge jets to make certain that they are not damaged, and that walls are not distorted so as to deform the holes. Test idle tubes by blowing or sucking to make sure that metering holes are clear. Inspect small ends to make sure that they are not damaged so as to deform the metering holes. Replace any parts whose condition appears doubtful. Pump Piston, Discharge Nozzle and Related Parts. Inspect pump piston leather washer for cracks, creases, turned edges, or other damage. Test relief valve in piston for tight seating by blowing on lower end of piston; if valve is seating tightly it will not be possible to blow through it. Test discharge nozzle by sucking or blowing to make sure that all holes are clear. It is advisable to replace pump inlet and discharge channel check valve balls since these parts are small and difficult to inspect. Inspect check valve ball seats in main body with a good light. If a seat appears rough, place ball in seat and tap lightly to swage a good seat, then discard the ball. Throttle Valve Body and Idle Needle Valves. Be sure that the idle discharge holes, the air bleeders, and the barrels of the throttle valve body are clean of all carbon deposits. A comparatively small amount of carbon in barrel may have the effect of decreasing the bore sufficiently to prevent the throttle valves resting at the correct angle when closed. This can have serious effects on performance because the distance from the throttle valve, when closed, to the edge of the idle discharge hole must be kept within close limits to the established dimension. Check the size of the upper idle discharge hole by inserting the shank of the correct size drill. This has the further advantage of removing any foreign matter that may be obstructing the hole. The lower discharge hole for the idle needle valve should be checked in the same manner. 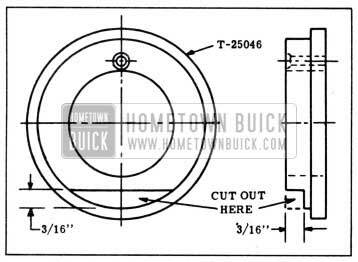 For drill sizes see 1951 Buick Stromberg Carburetor Calibrations (par. 3-1). Inspect seats for idle needle valves for scoring or other damage. If ends of idle needle valves are grooved or bent, replace the valves. Check wear of throttle stem bearing. There should not be more than about .006″ play, otherwise air leaks will interfere with performance. Throttle Valves, Throttle Lever and Stem Assembly. See that throttle valves are not bent and do not have burrs or sharp edges. Replace if damaged. Inspect throttle lever and stem assembly for wear on bearing surfaces. Check pump rod holes for wear and also see that lever is not loose on stem. Replace if necessary. Accelerator Vacuum Switch. Disassemble, clean, inspect, and re-assemble vacuum switch as described in paragraph 10-33. 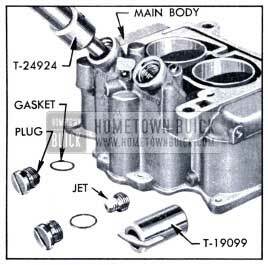 When assembling the carburetor use all new gaskets and any additional new parts found to be necessary during inspection. Attach fast idle rod to fast idle cam with washer and hook the cam spring into groove in rod. Install spacer washer, loose lever lock lever, and fast idle cam on post in throttle body, then install snap ring in groove in post. See figure 3-68. Install throttle lever and stem assembly in throttle body and install switch lever, lockwasher and nut on end of stem. When throttle lever is in wide open position the switch lever must be toward bottom of body and switch arm must point away from body. 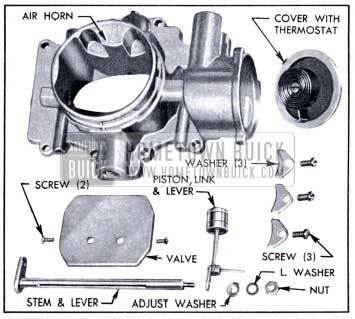 Reinstall each throttle valve in the same barrel of throttle body from which it was removed, as shown by identification marks made before removal. The dash mark (-) stamped in valve must be toward top of body. Loosely install new valve screws and carefully align the valves with the scribe marks previously made along edges of valve stem, then tighten screws. See figure 3-69. With valves held in closed position, hold throttle body to the light and check for even clearance between each valve and the barrel. See figure 3-69. If clearance is excessive at any point, shift valve in stem until it fits the barrel with the least amount of light showing around the edge, then tighten screws firmly and recheck clearance. When valves are properly set and all screws are securely tightened support heads of screws on suitable steel block and stake opposite ends of screws. Install both idle needle valves and springs in throttle body. Seat needle valves lightly with fingers, then turn each valve out exactly 1 1/2 turns off seat. Do not use a screw driver or otherwise force a needle valve against its seat; this will score the valve and ruin it for service. Place new lead gaskets over beveled ends of main discharge jet. Use Jet Remover T-24967 to install jets in main body, being careful to position jets so that flat surface is parallel with the direction of air flow. See figures 3-70 and 3-64. Install main metering jets, using Jet Socket T-24924. Install main discharge jet plugs, using new copper plug gaskets if available; otherwise make sure that plugs and seats are clean to insure tight joint. Tighten plugs with screw driver T-19099. See figure 3-63. Place new main body gasket on throttle body. Insert short ends of idle channel wires in idle channels of throttle body and guide opposite ends into idle channels in main body as it is placed on throttle body. See figure 3-71. Install long main body attaching screws on same side as idle needle valves and short screws on opposite side, using lockwashers on all screws. Place check valve ball in bottom of pump cylinder and install retainer clip, using Replacer T-25360 (fig. 3-67) or long nosed pliers. Inner end of clip must point down towards ball. See figure 3-62. Install pump discharge channel check ball, then install new nozzle gasket, discharge nozzle, and nozzle screw with new gasket. See figure 3-62. Install both idle tubes and the power by-pass jet with a new gasket. See figure 3-62. Install choke stem and lever assembly in air horn, then install choke valve in stem, using new screws. The dash (-) mark stamped in valve must be toward top of air horn. Close choke valve and check for uniform clearance between edges of valve and wall of air horn. Valve and stem should also have a slight end play. If clearance is not uniform, or valve sticks in air horn at any point, loosen screws and shift valve to obtain uniform clearance and freedom from sticking. It is important to have the choke valve fit properly, otherwise hard starting may result. After valve is properly placed and screws are tight, make certain that choke stem operates freely and that choke valve will drop freely of its own weight. Support heads of screws on suitable steel block and stake opposite ends of screws. Install choke vacuum piston in its cylinder in choke housing of air horn, and place end of lever over end of choke stem. Do not use lubricant of any kind on piston or in cylinder. Install adjusting washer with serrated side toward piston lever, then install lockwasher and nut, leaving nut finger tight. Set choke valve in proper relation to vacuum piston, using Piston Setting Gauge T-25046. NOTE: First type Gauge T-25046 must have a segment sawed from inner end as shown in figure 3-72, in order to provide clearance for raised section in lower side of choke housing. Second type gauge (T-25046) has inner end reduced in diameter to provide clearance. Install Gauge T-25046 so that the small hole fits over the pin on choke lever and outer flange of gauge pilots in choke housing. Turn gauge until the two indicator lines on face of gauge are centered on the end of indicator boss on choke housing. See figure 3-73. Hold choke valve tight against a No. 29 drill placed between upper edge of valve and wall of air horn then lightly tighten piston lever lock nut with Wrench T-25047. Remove drill and gauge, close choke valve and securely tighten lock nut. Recheck the setting to make certain that adjustment did not change. If readjustment is necessary be sure to loosen lock nut to free the serrated adjusting washer. Install thermostat and cover assembly with washers and screws. Rotate cover in direction of arrow until choke valve just closes then align the “V” punch mark on cover with end of boss on choke housing and tighten screws. 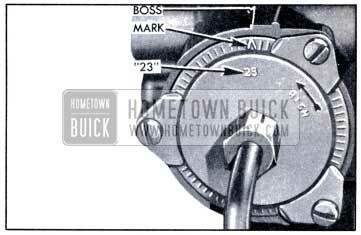 NOTE: The correct thermostat and cover assembly has the figure “23” stamped on cover adjacent to “V” mark. Do not use a part with any other number. See figure 3-74. Install vacuum power piston in air horn and carefully stake in place at three points. Piston must operate freely in cylinder but do not apply lubricant of any kind. Install float hanger with a new gasket on each side and install float needle valve seat, using Wrench T-20140. See figure 3-59. Place new gasket on air horn. Attach float needle valve to clip on float lever and attach float assembly to float hanger with fulcrum pin, which should be tapped lightly so that serrated end ”bites” into hanger leg. Make certain float lever does not bind in float hanger due to distortion of the legs. With air horn inverted, place Float Gauge T-24971 on top of gasket so that the locating buttons on gauge fit in holes in air horn. 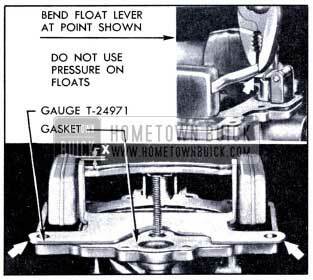 Gauge must rest flat and solid on the gasket. See figure 3-75. Adjust each float so that the inner side just touches the upright guide of the gauge; this must be a light fit, without clearance and without excessive drag on the guide. Check height of inside edge (not the seam) of each float with reference to top end of upright guide on gauge, as shown at “X” in figure 3-75. Floats must be 5/64 ” above ends of guides. If any change in height is required, bend float lever with pliers at point shown in figure 3-75. Do not use pressure on floats. The float needle valve must have 1/16″ of travel from closed position. Check travel and adjust, if necessary, by bending the float lever stop to give specified travel. Install new felt washer on stem of pump piston and install pump piston assembly in air horn. Install air horn assembly on main body, using care to avoid distortion of float assembly and making certain that pump piston leather washer does not have any creases or curled edges when it is inserted into the cylinder in main body. See figure 3-58. Install cover screws and lock washers. 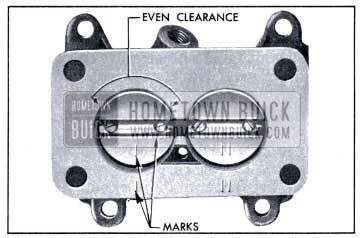 Attach the accelerator vacuum switch wire clip with corner screw to rear of choke housing. 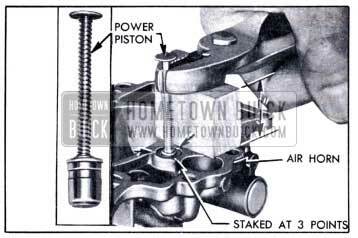 Attach pump lever spring with screw adjacent to pump piston stem. Tighten all cover screws evenly. Attach pump lever to pump piston stem and install brass washer and cotter pin. Attach pump lever to air horn with fulcrum screw (left hand thread), placing the spring washer between screw head and lever; hooked end of lever spring must engage lower edge of lever. Make sure that pump rod is connected to the middle hole in throttle lever, then connect pump rod to pump lever and install bras washer and cotter pin. Attach fast idle rod to choke stem lever and install cotter pin. 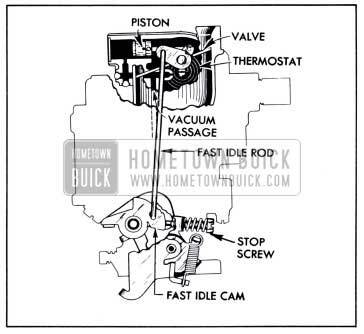 Check adjustment of fast idle cam and choke unloader (par. 3-28). Attach accelerator vacuum switch to throttle body with two screws, using a new gasket between switch and body. Check switch timing as described in paragraph 10-33. Make sure that carburetor gasket is in good condition; then install carburetor on intake manifold. Clean the gasoline filter (par. 3-7), install it on carburetor, and connect the gasoline pipe. Connect the vacuum spark control pipe. 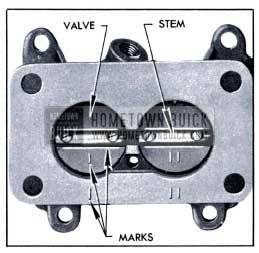 Connect the choke upper heat pipe to choke thermostat cover, avoiding excessive tightening which may change the position of cover and affect thermostat setting. Connect the accelerator vacuum switch wires and check switch timing as described in paragraph 10-33.